Looking for something different? How about an igloo? Igloos were the temporary homes of Canadian, Greenland and Arctic Inuit Eskimos, and while they are still relatively common in these icy latitudes today, they are no longer used for strictly utilitarian purposes but are more likely to be built to impress the tourists. The inhabitants of the far north quickly discovered the insulating and sound-proofing properties of snow. You can’t use just any old snow to make an igloo though. You have to use the fine grain, a snow whose crystals have been eroded by the wind and that have lost all their dendrites. Dendrites (from the Greek dendon: tree) are the ramifications of a snowflake that give it its very specific and familiar shape. With all of their dendrites, the crystals form fresh snow or powder that it would be impossible to make an igloo with! Only fine grain snow is compact enough to be cut and shaped to size. The hole dug out to extract the blocks of ice is used as the igloo’s base. The blocks measure about a metre in length and are about 40cm high and 20cm thick. They are generally placed in a spiral. The entrance is built very low to shelter it from the wind and some igloos even have a small tunnel. There has to be some form of ventilation, otherwise the CO2 produced by breathing could lead to headaches and a feeling of sickness. Using heating made with whale fat or seal fat, the Inuits managed to get a temperature of around zero degrees when it was minus forty outside! Nowadays, just a candle can achieve miracles. Unless you have some animal skins, which are incredibly effective in an igloo, you’ll need to be well kitted out if you want to have a cosy night. You need a good sleeping bag, but not duck feather made for the Antarctic or for Everest, otherwise you’ll be too hot to sleep. The temperature in a well-made igloo can be over 2 degrees in the middle of the night. The igloos built in our mountains are made for 6 people. While some are built in pure Inuit tradition, others are designed to the standard of a 2 or 3-star hotel room with a good mattress, thick carpets on the floor and soft, warm duvets. Some igloo villages even have a sauna and a jacuzzi. Meals are served directly in the igloo. The excellent sound-proofing will let you sleep till late in the morning, but it would be a shame to miss out on the chance to be first on the pistes for once, setting out for the deserted mountains before the morning rush for the ski lifts. Only a night in the mountain can offer you such unforgettable moments. Where can you sleep in an igloo in France? You can get to the 2300 m altitude plateau from the top of the Telemix lifts (combined chair lift and cabin) at Roche Rousse, where you’ll find a dozen igloos. You can ski to the village, spend a starry night sleeping under the ice and set out again after breakfast for another day on the slopes. And if you’re up for playing the mushers while waiting for it to get light, there are 26 huskies in the igloo village as well as the longest zip-line in the world. Here, you”ll find an entire village of igloos set in the heights of La Plagne. Enjoy! A quick ride from the Dôme de l’Alpe chairlift and you’ll find yourself in the village of igloos at Sauze where you’ll get a real feel of a polar expedition in the far north. There’s a high altitude restaurant nearby where you can eat in the warmth, and then back to the igloo to curl up in your duvet. 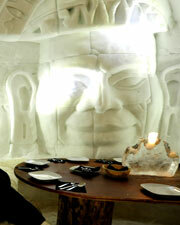 You can also book a special Saint Valentine candlelit dinner in the igloo. From the top of the wooden chairlift in la Croix, you’ll be welcomed by the pretty little village of igloos. The igloo village in Kanata can house up to 25 people. You’ll find it next to the high altitude restaurant on the edge of the forest. Enjoy a good meal beside the log fire and then slip into your sleeping bags. You’ll leave well refreshed for the next stage of your skiing holiday! Try a night at 5° at an altitude of 1800 metres in the Kanata igloos (4 to 6 people), built from blocks of snow in real Inuit tradition. You get reach it by ski from the chairlift, with snow shoes or simply on foot. During the magical evening, take advantage of the solarium and the bar, and try the local specialities. The price includes the night in the igloo, dinner and the sleeping gear. And what about our European neighbours? Iglu-dorf, there are 7 igloo villages in Switzerland (Gstaad, Klosters, Zermatt, Engelberg, St Moritz), Germany (Garmisch-Partenkirchen) and Andorra (Grandvalira). Everything has been designed to make your stay unforgettable. Choose between a standard or romantic igloo, a romantic suite or a family igloo. In some cases, you’ll get a personal jacuzzi as a bonus! The Andorran village will offer you a ride in a dog sleigh or on a snowmobile. You can get married in an ice chapel in Engelberg, have an unforgettable party in an igloo disco, have a drink in an igloo bar... and a good sleep «naturlich!». In the morning, snuggled up in lambskin, enjoy your breakfast among the ice sculptures made by the Yellowknife Inuits (Northwest Territories). In the ice palace at Kemi in Lapland, it’s not simply the once-in-a-lifetime night that attracts the guest, but also the chance to enjoy the restaurant, spend a night in the hotel, celebrate a child’s birthday or slide down an ice toboggan in this unique and unforgettable location for weddings and christenings, a private party or even a business meeting. The special lighting and ice sculptures will inevitably leave you enchanted. Still in Lapland, Kakslauttanen is the biggest igloo village in the world. Here again, in addition to spending a night in the ice, you can eat in the restaurant, visit the ice art gallery, ride a snowmobile, go for a ride in a sleigh pulled by dogs or by reindeer, and even fish. You can also enjoy a night under the stars by renting a glass igloo instead of a snow igloo. Enjoy the starriest night of your life!